The popular holiday region Hohe Tauern National Park is ideal for for cyclists and mountain bikers. The 4-Star Bike-Hotel Tauernblick serves as the ideal starting point for exciting bike tours on your bike holiday in Salzburg. Start directly with the hotel in Bramberg and experience pure fascination. Whether challenging mountain roads, pleasant family bike paths or action packed downhill trails: here you will find everything your cyclist heart desires. Our onsite bike guides will individually advise you on your route choices. Explore the area alone or with a guided tour. The beautiful mountain scenery will make your summer holiday an unreal experience. As one of the most beautiful valleys in the Pinzgau, Habachtal is also a popular bike tour destination. The route runs along the Tauernradweg cycle route. At the beginning, the road is still relatively easy. Around the old Kramer Bridge is when you will start to sweat. Once you have managed the first incline, the road continues on comfortably. 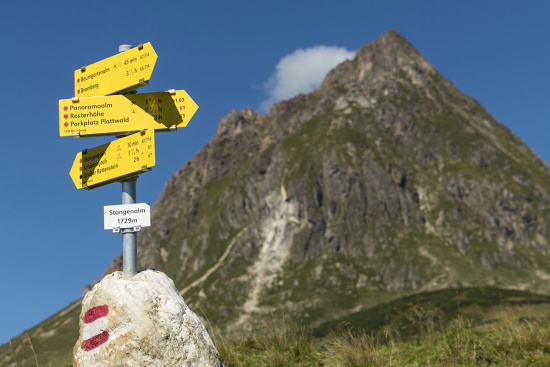 Stop off at the “Enzianhütte” or the “Alpenrose” inn and savor a light snack for the remaining cycling-kilometers. At the end of the road, you will find a particularly quaint hut. On the ride home take a look next to the Gasthof Alpenrose and see if you find any emeralds – it could be your new lucky charm. Explore the Tauern Bike Path towards Hollerbach. After the village and right by the power plant, an adventurous mountain bike trail through the valley begins. This trail is particularly well suited for mountain biking beginners. The many downhill sections give you time to rest. Back in the valley the Senningalm awaits you with its beautiful garden to relax in. Enjoy the Austrian Alm-delicacies before continuing your tour. Sporty bikers can ride through Ofnerboden to Materialseil lift. From here the trail leads back to the hotel. Tip: Walk and visit the Fürther hut – it’s about 1.5 hours. A very nice hike awaits you! The Steineralm tour starts in the Neukirchen direction. After the village cycle along the scenic road to the Rechtegg Inn. At the next federal forest road, you can enjoy the stunning natural surroundings. Take a break at Steineralm and let yourself be enchanted by the beautiful views of the Großvenediger. A demanding forest ride will lead you to the Gensbichllift and after all the hard work you are able to go downhill again. For the particularly daring: there is also a downhill course on this trail! You will then return to Neukirchen and from there back to the hotel via the Tauern bike trail. Tip: Stop at the Servus Line and enhance your technical skills! This route begins with a light incline up towards Wildkogel.This tour is a challenge for true professionals: difficult road conditions and steep paths. Once at the top, however, you will find a beautiful panorama. Marvel at the stunning mountain ranges of the Salzburg mountains and feel a bit of freedom. On the descent via the Neuhausweg to Sender, you can recover from the demanding trails from the outward journey. Guests can enjoy the Weyer ruins, before continuing their journey home along the forest road. Start directly at Hotel Tauernblick and cycle along the asphalt road towards the district of Mühlbach. From the Mühlbacher Sonnberg ride through the Peril Farms and the federal forest road to the Platt Forest and then to the reservoir. A photo-stop is a must at the reservoir lake! The wonderful view of the National Park Hohe Tauern will make your holiday unforgettable. Shortly before the reservoir you will find a water station for your thirst. The route from the reservoir pond to the view of Pinzgau and back is perfect for less enduring bikers.The next rest stop located about 20 minutes away at the Panorama-Alm. A single trail takes you up to the summit cross and a 2,000m above sea level photo opportunity. After an exciting downhill section you will find the Stangenjoch cart path that takes you to Baumgarten Alm. There you can treat yourself to a refueling snack before you continue your tour in the Mühlbachtal and back to the hotel.